This week in 1988, the new-look ARIA chart was into its second week, although it's unlikely most people knew anything had changed, other than a few redesign nips and tucks. I certainly didn't notice the line down the bottom about who had compiled the chart had changed from the Australian Music Report (AMR) to the Australian Record Industry Association (ARIA) until many years later. So, for all intents and purposes, the chart carried on as it always had. One thing that was noticeably different this week was that all five of the Breakers were songs that missed the top 50. Usually at least one or two would end up reaching the main chart, but this week's Breakers were all unlucky in that regard (although one of them did make the top 50 according to the AMR). Things also changed at the top of the chart with Cheap Trick making way for Louis Armstrong's "What A Wonderful World" to spend its one and only week at number 1. Next week, there would be a very exciting development at the summit of the top 50. This was the beginning of the end for the Aussie band behind such great songs as "Heaven (Must Be There)", "Can't Wait To See You" and previous single "Groove". Quite why "It Must Be Love", which sounds a little bit like "We Will Together" part two, flopped so spectacularly is unclear, but Eurogliders wouldn't make another appearance in the top 100 despite trying their luck with two further singles from Groove, "Listen" and "Precious". The thing about quirky pop acts from the early '80s (see also: Toto Coelo, Bow Wow Wow, Haysi Fantayzee) is that it was easy to get sick of their songs very quickly - and that was especially true with Thomas Dolby, who'd landed two modest hits in Australia with "She Blinded Me With Science" and "Hyperactive!". "Airhead" was very much in the style of those two songs - low on melody and high on wacky vocals. Speaking of wacky, the album "Airhead" came from was called Aliens Ate My Buick. I've said it before and I'll say it again: I was obsessed with Debbie Gibson in 1988, even if she did tear the leg of her jeans and draw a smiley face on her knee. Australia was less keen, with "Shake Your Love" barely having dented the top 40 and follow-ups like this missing the top 50 altogether. Here's an interesting single - for more than one reason. Originally released back in 1958, "My Baby Just..." was the latest track to benefit from being used in a British commercial, in this case, an ad for perfume Chanel No.5. Add a clip from the animators who'd go on to create Wallace and Gromit, and the jazz singer Nina Simone landed her first UK chart entry in nearly two decades. 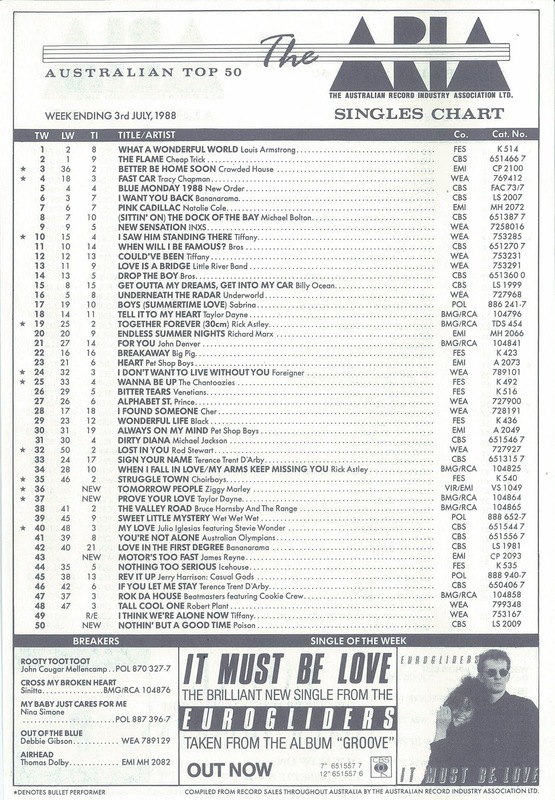 In Australia, this was one of the first cases of a song missing the top 50 of the new in-house ARIA charts but peaking inside the top 50 of the Australian Music Report (number 36). Sinitta wasn't having much luck in Australia in 1988, with her three big Stock Aitken Waterman-produced singles failing to enjoy the chart success they'd had in the UK. "Cross My Broken Heart" was her second single in a row to peak outside the top 50, following "G.T.O." from earlier in the year. She wouldn't even manage a top 100 spot with next release, "I Don't Believe In Miracles". John had been on a bit of a hot streak with his The Lonesome Jubilee album, but that came to a crashing halt with this fourth and final single, which peaked a good 30 places lower than any of the previous hits. Whether it was due to saturation airplay or some other reason, I'm not sure, but I was quite partial to JCM at this point in his career - but by the time he returned in 1989 with "Pop Singer", I'd definitely moved on. 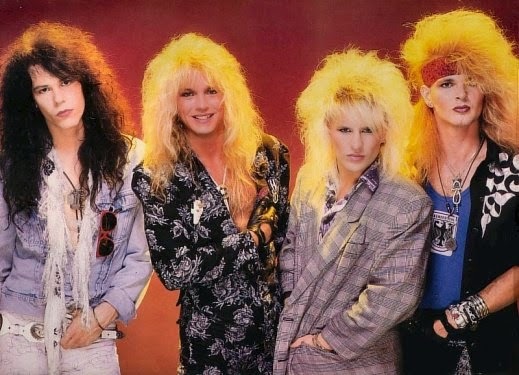 I was also quite partial to a bit of hair metal in the late '80s - well, by "quite partial", I mean that I generally allowed myself one song per year to like. In 1988, that song was "Nothin' But A Good Time", which held its peak position for three weeks and established Poison as a band to rival Bon Jovi over the next couple of years. Of course, despite their large fanbase between 1988 and 1990, Bret Michaels and pals were never anywhere near as good as Bon Jovi, but it was fun while it (briefly) lasted. This song from the Australian Crawl vocalist would wind up as one of his biggest solo hits. Although not originally on his debut self-titled album, "Motor's Too Fast" would eventually be added on when James Reyne was repackaged for release overseas and would make a brief return to the albums top 50 in October. Hot on the heels of debut hit "Tell It To My Heart", which was still sitting at number 18 this week, diva in the making Taylor unleashed this second single - and I actually preferred it, even though it wouldn't end up being as big a hit in Australia. In the US, "Prove Your Love" matched the number 7 peak of "Tell It To My Heart" and became the second of seven consecutive top 10 hits for her there. In 1988, Ziggy joined Natalie Cole, Julian Lennon and Nancy Sinatra in the club of second generation hit-makers - but he and the Melody Makers had actually been releasing records since 1979, when Ziggy's father, reggae legend Bob Marley, was still alive. "Tomorrow People", from the group's fourth album, finally did the business, hitting the Australian and US top 40. It would be the group's sole top 40 hit in both countries, which was one more than Bob ever had in the US and equal to the number he had in Australia during his lifetime ("Is This Love" reached number 11 here in 1978). Next week: a chart record is made at the top of the charts, while the follow-up to a recent chart-topper debuts at the bottom of the chart. It's weird how the Eurogliders were pretty much over as soon as 'It Must Be Love' was released. Take 40 Australia were playing a different chart in '88 to both AMR and ARIA, and 'My Baby Just Cares For Me' dented the lower end of it briefly; so I didn't realise until a few years ago that it didn't actually make the ARIA top 50. I'm sure nobody's ever analysed Sinitta lyrics before, but it's always puzzled me how her 'best friend' in the song wouldn't know that she was going on a date with Sinitta's 'guy' when she told Sinitta about the date. I remember some kids in my grade 4/5 composite singing "rooty toot toot in the back of the ute", which I always thought was a lyric from the John Cougar Mellencamp song, but listening to it now, I see those lyrics aren't part of it. I wonder what the impetus was for James Reyne to record a new song not originally from his debut solo album, and not the first release from his second album? The US record company wanted something different?